Kunwarji Bavaliya is a five-time Congress legislator from Jasdan seat in Rajkot and had quite the Congress party yesterday. Kunwarji Bavaliya took over the Water Supply, Animal Husbandry and Rural Housing ministries. 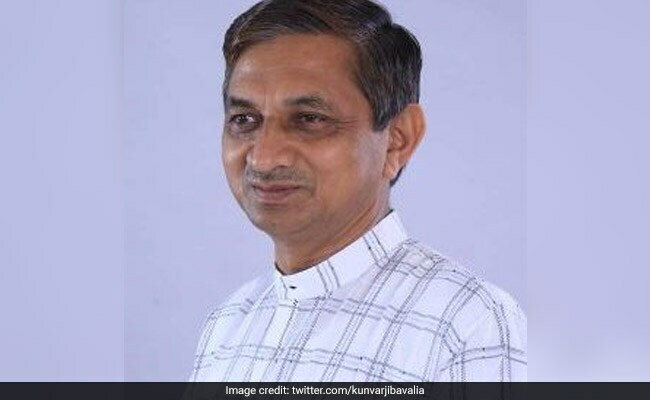 A day after quitting the Congress and joining the BJP-led government in Gujarat, senior OBC leader Kunwarji Bavaliya today took charge as the Water Supply, Animal Husbandry and Rural Housing Minister. Talking to reporters after taking charge, Mr Bavaliya said his priority would be to ensure regular supply of drinking water and upliftment of the Koli community, to which he belongs. "All the portfolios are of my interest as they touch the issues of the rural population. I am confident that I will be able to do justice to all these departments," he told reporters. Mr Bavaliya, a five-time Congress legislator from Jasdan seat in Rajkot, had quit the party yesterday and was inducted as a cabinet minister into the Vijay Rupani government hours later. The OBC leader, who enjoys considerable clout in the numerically-strong Koli community in Saurashtra region, said that he would soon call a meeting of officials of the water supply department to discuss various issues. "Solving problems of drinking water supply will be my priority. I would try my best to bring about a permanent solution to the water scarcity problem," Mr Bavaliya, who had represented Rajkot seat in Lok Sabha between 2009 and 2014, said. "I will also work for my Koli community. Due to the lack of education, they are facing problems and became victims of superstition. Education facilities are also less in their areas," he said. When asked what prompted him to quit the Congress party, which he had represented for over two decades, Mr Bavaliya said his supporters urged him to take the decision of joining the BJP to do work which was not possible while being in the opposition party. "I have taken the consent of the people of my constituency before joining the BJP. They had urged me to do something different to solve the pending problems. I agreed to their view that some works could be done only if you are in the ruling party," Mr Bavaliya claimed. In the hectic political developments yesterday, Mr Bavaliya resigned from the Congress, drove to the BJP office where he was inducted into the party and took oath as the state minister at the Raj Bhavan in Gandhinagar. With the entry of Mr Bavaliya who hails from Saurashtra, the BJP is hoping to attract voters from Koli community, which has a sizable presence in the region. The BJP fared badly in Saurashtra in last year's Assembly polls as the Patidar community deserted it following the quota agitation led by Hardik Patel.